Even the heaviest smoke, soot, water, sweat, and grime is easily washed away with TKO Powdered Pre Soak. The highest quality laundry pre-soak on the market. Our most popular pre-treatment due to its simplicity and ability to lift soot, soils, and stains from everything from sports equipment to stuffed animals and everything in between. Esporta trainers have come to call TKO a hero product because it makes you look like a hero by restoring items that you would never think could be restored. Contains enzymes designed to digest stains and soils that even bleach cannot remove. 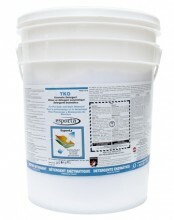 TKO is safe for use on all waterfast colours and fabrics, including permanent press.